This is a closer look at that guy, as big as I can get it. 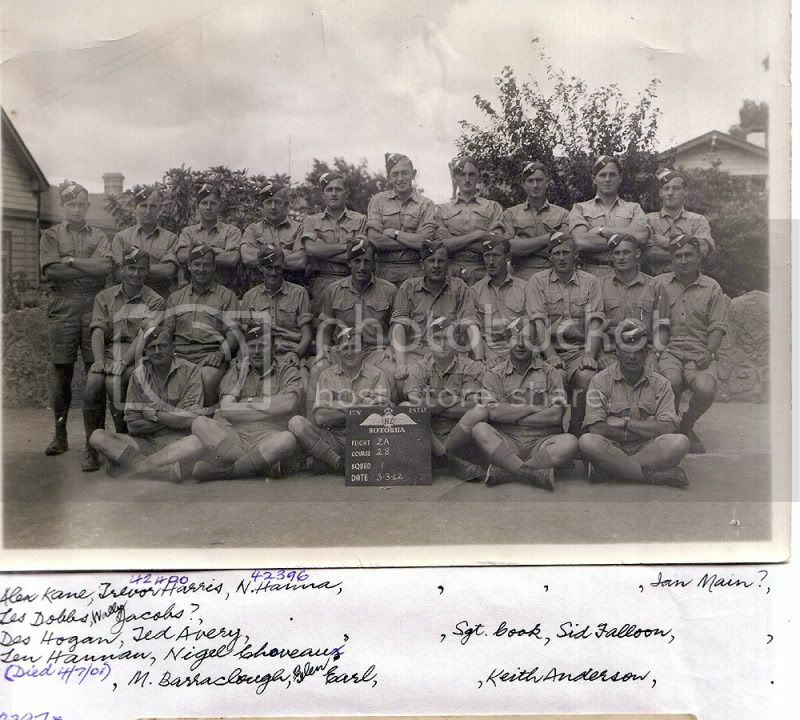 I don't think it is any different from the uniform that Jim Ross himself and others are seen wearing in this photo from Jim's collection, which was taken apparently at Harewood. I don't know if that was during his ITW training which he did at Harewood, or his later posting back there with No. 3 (GR) Squadron. At either time Jim was not destined to be going to the tropics for a long time (he was issued his tropical kit at Whenuapai in September 1942, there are photos). I wonder, was it maybe a fatigues uniform? Perhaps a more stylish development of the lighter coloured uniform that many airmen got when they joined up that looked just like this but without any pockets? As for your parade shot, can you please scan some sections larger to give us more detail? it's hard to see what's going on. Does that sign say SEA? I showed this photo from Jim Ross's collection to Norm Todd today. Norm and Jim joined up together and served right the way through the war in mostly the same units, particularly in NZ. The first thing he said was "What are those uniforms??" He had not seen the photo before, but he said he doesn't recall having uniforms like that at all - pointing out that they look like the tropical kit but they a) have no badges on them which is a good point I had missed, and b) he and Jim never got issues tropical kit till they got to Whenuapai and this is - he agrees - Harewood which means this is before then. Apart from Jim Ross himself in the photo, Norm recognised that the corporal on the right was Snow Neils but he can't recall if Snow was on No. 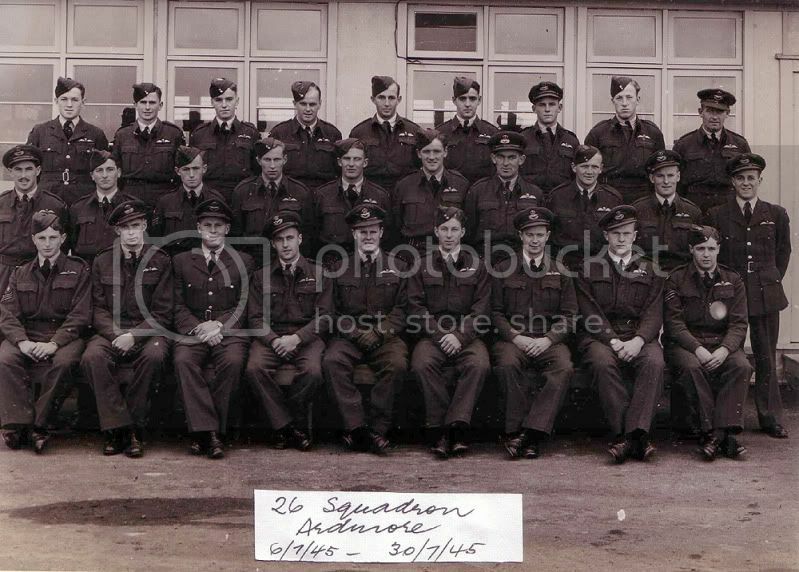 3 Squadron when they were there or if this is from an earlier period when they did their initial ITW training there. I asked if these might have been fatigues uniforms and he said perhaps, with the blue uniforms being their No. 1's, but he cannot recall ever having light uniforms at Harewood. So this is another minor mystery. It is indeed odd that they don't have the eagle badges. I wonder if these are old army uniforms issued for engineers (as they were) for hangar work in lieu of overalls? This looks like the "Ref. No. 1175. RNZAF OFFICERS TROPICAL SERVICE DRESS JACKET"
Hmm, I just looked at sme other photos of No. 3 GR Squadron guys taken the day they were issued their tropical uniforms, and those also have no badges. I am now convinced that this must be Whenuapai in the photo and taken after the tropcial kit was issued, which means these will be members of No. 3 (GR) Squadron. Sorry for the confusion, at least I am now 99% sure of what the photo subject is. Now I'd like to know who the other chaps with Jim and Snow are. Definitely Post War, but some of you may recognise those in the photo! I was only looking at this photo two days ago, in a lot that Don Simms photographed for me from Wigram's archives. It has the names on the photo, but some of them I knew anyway. All Safety and Surface trade I believe. This is a photo I took of a photo on the wall of wartime fighter pilot Gavin Gullery. 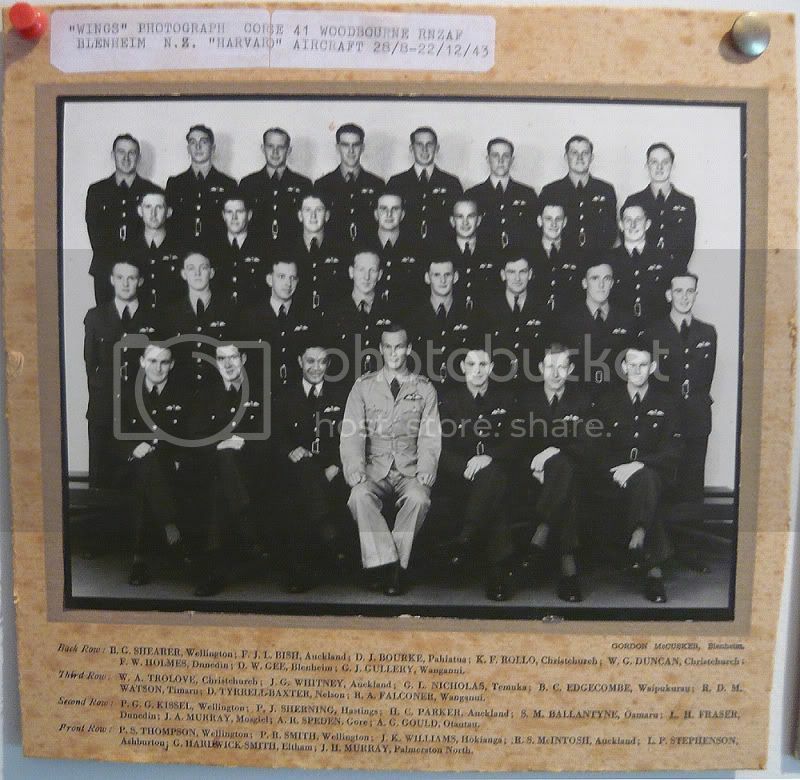 This is his Wings Course, Harvard phase at Woodbourne. This is when he was in No. 26 (Fighter) Squadron. 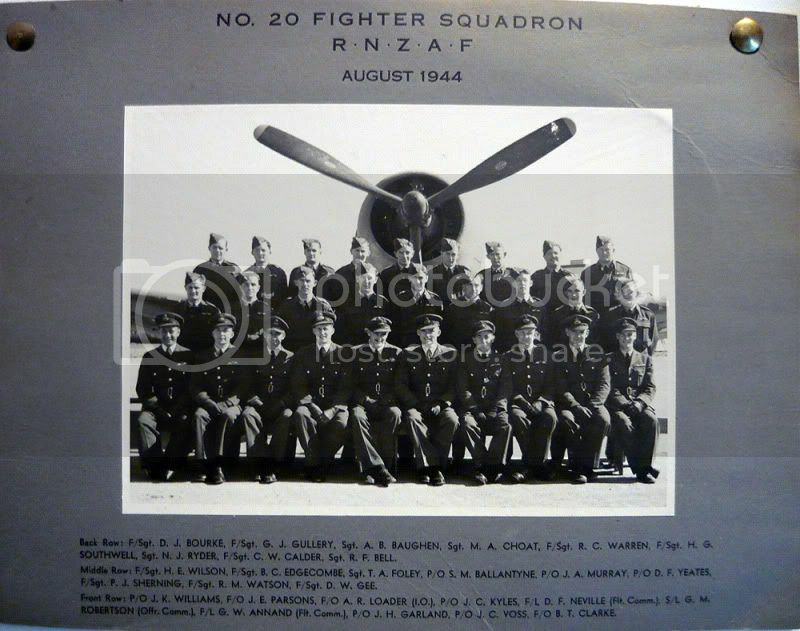 he said they were only formed for a matter of weeks and Air HQ decided that as the 13th fighter squadron it might be unlucky, so they disbanded this unit and reformed as no. 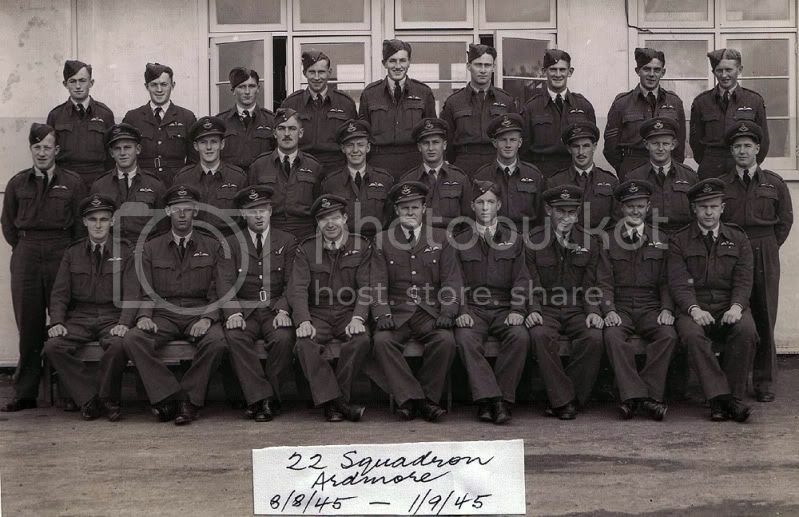 22 (Fighter) Squadron with much the same personnel. The CO of both Squadrons was Squadron Leader G. A. Delves, and Noel was a Flight Commander. 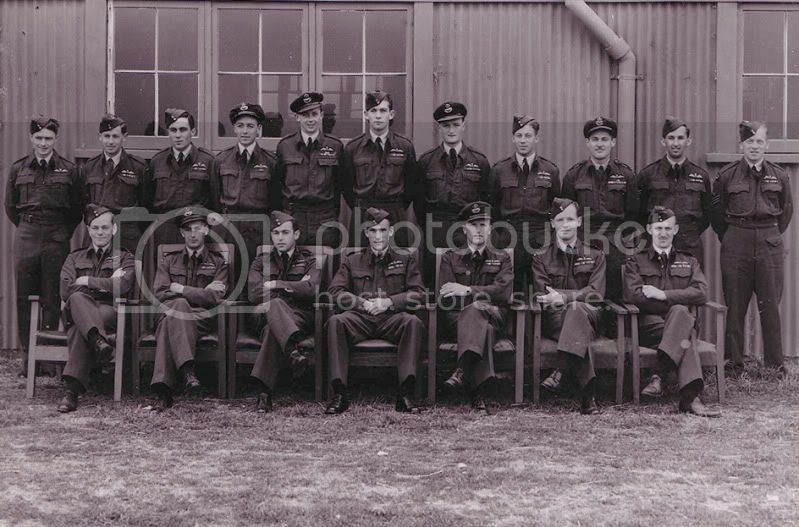 Noel is seen in the 26 Sqn photo seated fourth from right, and in the 22 Sqn photo below it also seated 4th from right. This last photo is of the pilots on the Second Tour of No. 14 (Occupational) Squadron in Japan 17 April 1947 till 1948. 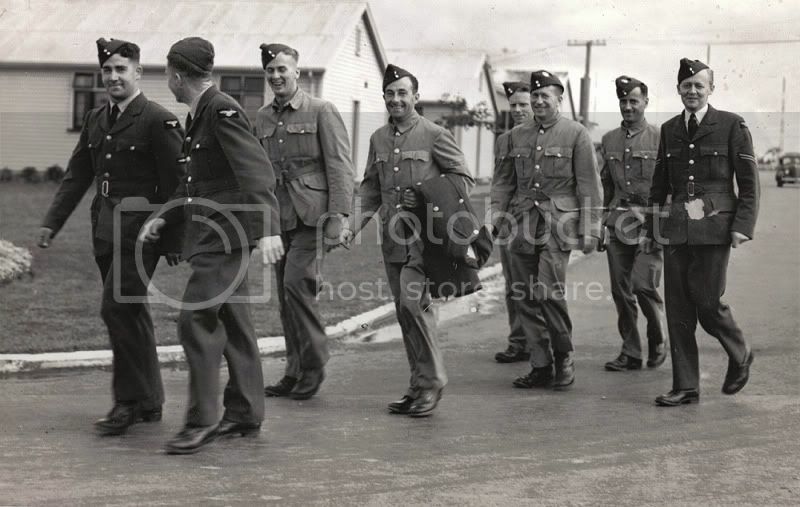 This shot was taken at Ohakea on the 7th of March 1947. 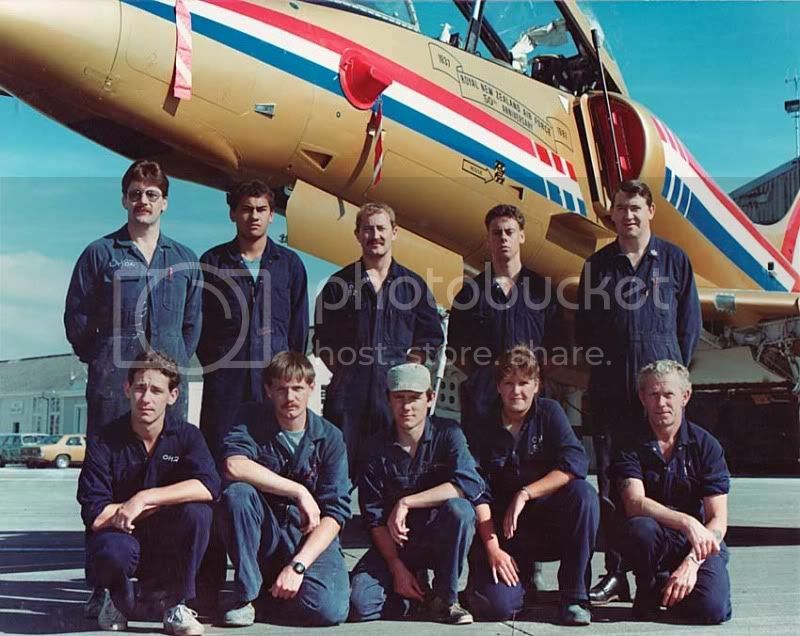 Great photos there...the fella sitting to the right of Doug St.George is John Claydon... who later flew the Antartic aircraft on the Hillary crossing ... still alive and in CHC I believe. Brilliant info, thanks very much for that! 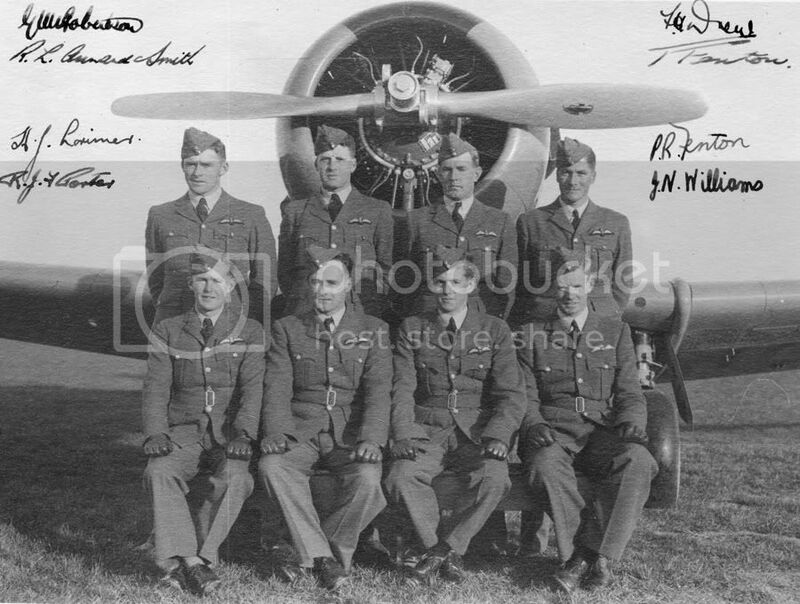 Now for the Harvard lovers, I suspect that some may know guys in these photos. This next one has the names on it. They are, Robertson, Drew, R.L. (Arnold?) Smith, Fenton, Lorimer, P.R.Fenton, Porter, Williams. Kontrolsports, your welcome, Merry Christmas, Shamus. Peter left the RNZAF and re-enlisted 11 April 1961. He and I were on the same recruit course at Wigram. Yes, he was on 5 Airframe course, but he must have left the service as prior to his rejoining in 1961 he had worked at NAC. So, as he had a break in Service he had not done quite 30 years in 1979. I don't know if Peter is still alive. But if he is, someone may remind him how he tried to hide a Harvard in 1977 from being disposed - he was the inventory holder for all stored Harvards in 6 Hangar and he seemed to think he had a spare aircraft.